Used in image guided surgical procedures, surgical imaging is a transformational optical imaging technology. The technology is helping surgeons across the globe to perform complex surgical procedures. Owing to the increasing demand for minimally invasive procedures and rise in various health issues such as neurological and cardiovascular disorders the demand for surgical imaging is growing to perform image-guided surgical procedures. Technological advancements are resulting in the development of compact surgical imaging technology by various key players. Augmented reality devices are also being developed to help in visualization procedures and lead to efficiency, safety and enhance the surgical procedure. However, the high cost of investment in building the infrastructure to support surgical imaging devices is one of the factors hampering the growth of the market. Meanwhile, companies are also investing in the research and development of portable devices. Moreover, the government of various countries are also taking initiatives to help in the development of advanced healthcare infrastructure. The report on the global surgical imaging market provides key insights on various drivers and trends that will have an impact on the market. The report is based on both primary and secondary research. The report also talks about various segments and regions in the global surgery imaging market. Both quantitative and qualitative analysis is done in order to offer an estimation on the growth of the market. The report also provides in-depth information on the revenue in the past and the revenue expected for the forecast period 2017-2026. Key industrial developments that took place in the past and the developments that are expected to take place in the future are also provided in the report. Market dynamics are also covered in the report including drivers, opportunities, trends, and challenges that will play a key role in the global surgical imaging market. The report also offers data on market size in the terms of both value and volume in the coming years. The report also provides market attractiveness analysis, SWOT analysis and Porter’s five force analysis. Information on the upcoming technologies and technically advanced devices has also been provided in the report. The companies currently active can come up with new strategies based on the information provided in the report. The impact of various factors on the growth of the market has also been provided in the research report. 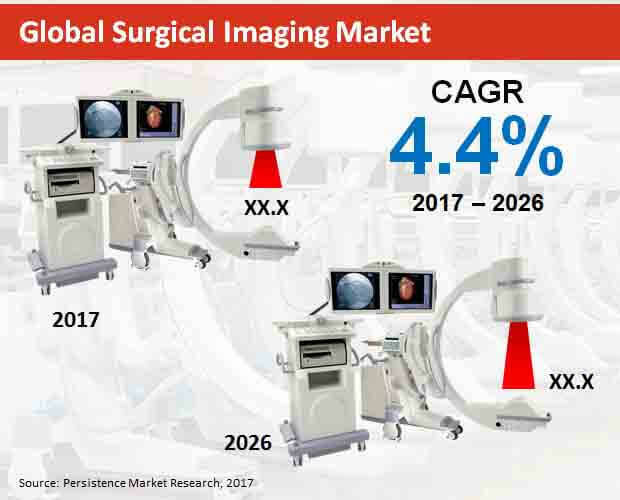 The report on the global surgical imaging market provides estimated numbers in terms of CAGR, year-on-year growth, revenue, for the global as well as the segments given in the report this can help businesses in identifying right opportunities in the market. The global surgical imaging market is segmented based on the product, end user, application, technology, and region. On the basis of product, the market segment includes Mini C-arm, full-size C-arm, and O-arms. On the basis of end user, the market is segmented into hospitals, ambulatory surgical centers, and other end users. By application, the market is segmented into neurosurgeries, orthopedic, cardiovascular surgeries, gastrointestinal surgeries, and other applications. On the basis of technology, the market segment includes image intensifier and flat panel detector. Region-wise, the market is segmented into Asia Pacific Excluding Japan (APEJ), Japan, Europe, Latin America, North America, and the Middle East and Africa (MEA). Surgical imaging technology is used for the image-guided surgical procedure. It offers ease in performing the complex surgical process. CT-scanners, C-arms and other devices are being used to view the area of surgery. Better accessibility of real-time data is becoming necessary, as it leads to the faster diagnosis and treatment, making it more reliable. Especially during the surgery, where the access to real-time 2D and 3D images that are reconstructed can be crucial during an ongoing surgery. Among various surgical imaging products, full-size C-arm is likely to emerge as one of the top-selling surgical imaging products. Full-size C-arm is projected to bring in nearly US$ 800 million revenue by 2026 end. Due to its ability to provide high-resolution clear images, full-size c-arm surgical imaging product is gaining popularity. Meanwhile, mini C-arm is also likely to gain nearly one-third of the revenue share by 2017 end. Compared to the different users of surgical imaging technology, hospitals are likely to emerge as one of the largest end-users. Hospitals are projected to surpass US$ 800 million revenue towards 2026 end. Increasing number of surgeries being carried on in the hospitals is leading to the increasing use of surgical imaging technology. Moreover, the rise in investment for deploying advanced technologies to carry successful surgeries at hospitals is also contributing to the growth of surgical imaging technologies at hospitals. Surgical imaging is likely to find the largest application in the orthopedic surgeries. By 2026 end, orthopedic surgery is projected to create an incremental opportunity of more than US$ 100 million between 2017 and 2026. Increasing number of orthopedic surgeries being done along with the high-preference for the minimum intrusive procedure is significantly resulting in the use of surgical imaging in orthopedic surgery. Meanwhile, surgical imaging is also likely to find application in neurosurgeries. Compared to the flat panel detector technology, image intensifier technology is likely to become more popular during 2017-2026. Image intensifier technology is projected to bring in nearly US$ 900 million revenue by 2026 end. Allowing clear view under low-light conditions and facilitating visual imaging for low-light processes, image intensifier technology is gaining more popularity. North America is likely to remain dominant in the global market for surgical imaging between 2017 and 2026. Increase in the number of sports injuries, well-developed healthcare infrastructure providing support for adoption of advanced surgical imaging technology, favorable government policies supporting the purchase of the advanced surgical imaging devices and reimbursement of the same are boosting the market for surgical imaging in North America. Meanwhile, APEJ is also likely to witness growth, due to increasing awareness and rapid developing healthcare infrastructure. Ziehm Imaging, Medtronic Plc, General Electric Company, Siemens AG, Koninklijke Philips N.V., Shimadzu Corporation, OrthoScan, Inc., Hologic Inc., Eurocolumbus Srl, and Allengers Medical Systems Limited., are some of the leading companies operating in the global market for surgical imaging.